101 by Tom Pitts is set in California only a few months before the legalization of marijuana. The game is about to change. 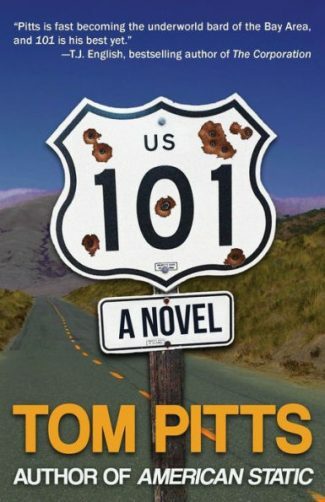 Tom Pitts’ new book, 101, is his third novel. He has also written two novellas. Of this output, I’ve read all but one of the novellas, and it’s safe to say that after reading about nine hundred pages of Pitts, I’ve yet to encounter a dull chapter. I’ll expand on that. I haven’t come across a boring page. The man has a distinct talent for starting a book on a fast note and keeping the action humming from there. He is adept at establishing a tense situation that grows into a plot with many threads and a large number of characters. The characters chase, betray, and kill each other singly, or in small groups, they pursue their conflicting agendas. Pitts did this in his first book, the novella Piggyback, in his novels, Hustle and American Static, and he does it in 101. Yet with each work, despite the basic similarity of structure, Pitts works variations on his material. Not one of his books has felt predictable, and because he has written no series characters, you never know who will end up alive or finish dead. As you flip from page to page in the unstable world Pitts creates, you the reader feel constant uncertainty. Northern California is his turf. Pitts centers this book in Humboldt County, famous for its redwoods and hippies, outlaw biker types, and weed cultivation, and the time is May 2016 – “Six months before California voters legalize marijuana.” Through action that stretches from remote cannabis farms to the cities of Oakland and Alameda, Route 101 is the connecting thread. As befits a California novel, a lot of the characters’ time is spent in cars. So many Californians all but live in their cars, and in 101, characters argue over, brood on, and work out their problems while driving. In some ways, this is a crime novel about different groups of people learning about each other, jockeying for position in a lethal game, while moving from point to point in vehicles. Given all the driving, you might expect crashes or chases, but Pitts gives us none. He doesn’t opt for the obvious. But he generates a lot of suspense by making traffic jams important, and what could be more typical on a California freeway? A car stalled in traffic creates strong tension when a showdown is imminent and someone needs to get to a particular place by a definite time. Vic waited while Jerry and Piper looked at each other, both their eyes lit up, fearful with the impact of Vic’s serious tone. “What’s it gonna be?” Vic said. They both sat their cells on the console. Vic represents an oold-school figure – he’s referred to as a “cowboy” – and the way he puts himself in great danger to save a woman he feels he owes a lifelong debt to differs from the selfishness of the youthful Jerry and Piper. Vic calls this selfishness out directly when he talks late in the book to Jerry’s mother, and in fact, throughout the story, the idea of loyalty is explored. Who is loyal to the people close to them and who is not? Small-time pot growers, temporary workers on the weed farms, ex-hippies living in the wilderness, drug-dealing biker gangs, an FBI agent, a San Francisco cop, a psychopathic killer from the UK, and a Belorusian mobster – Pitts presents a rich and varied cast of characters. And with nearly all of them, loyalty, or lack thereof, figures as an important component in how they deal with others. Bonds are tested between blood relations, like Jerry and his mother, and they are put under pressure among members of created families, as the biker groups have. Pitt is able to portray these relationships, fraught and complex, without slowing down his narrative momentum; he imbeds his thematic concerns in a non-stop stream of incident and dialogue, with extremely few pauses for backstory. Am I telling you too much about the plot of 101? No, and that’s for a reason. The less you know its twists and turns, betrayals and shifting allegiances, the better. Suffice it to say that Tom Pitts proves again that he’s among the best at presenting a gallery of motley characters who all have life, idiosyncrasies, and active inner lives. Old California outlaws, like the bikers, face off against new crime lords from Eastern Europe. Young criminals who talk too much and fancy themselves badasses have to submit themselves to a true badass, taciturn to the core, in Vic Thomas. Pitts’ 101 is a crime novel that’s a study in contrasts, and I for one loved spending time with everybody in it.